during the NFL game at the University of Phoenix Stadium on October 15, 2017 in Glendale, Arizona. In what started out as the Adrian Peterson show for Arizona, ended in somewhat dramatic fashion as the Arizona Cardinals allowed 33 second half points to the Tampa Bay Buccaneers, yet still held on to a 38-33 victory. Peterson capped an impressive performance for his new team, just five days after being traded from New Orleans with a 26-carry, 134-yard, two-touchdown performance in the win. Veteran and surefire future Hall of Fame WR Larry Fitzgerald exploded in the first half and finished with 10 receptions for 138 yards and a touchdown. Despite a 24-0 halftime lead, and ultimately a 31-0 lead just 3:02 into the third quarter, the Bucs, behind backup QB Ryan Fitzpatrick, scored 33 points in the final two quarters, including two spurts of 20 unanswered, and 13 unanswered points in a valiant comeback effort. Despite the effort, the Cardinals outlasted the Bucs 38-33 when Fitzgerald captured the last-ditch onside kick attempt from new Tampa Bay kicker Patrick Murray. The focus will now shift to the severity of franchise QB Jameis Winston’s injury sustained in the first half. This was the Adrian Peterson the Saints expected to get this season, even to some close to the “old school” Adrian Peterson, even down to throwing a fumble into an otherwise excellent game. Peterson got off to a fast start and meshed very quickly with the combination of Jermaine Gresham and the returning D.J. Humphries on the left side of the line, gaining 57 yards on eight carries off left end exploiting their blocking and shaky run defense from the Bucs’ defensive backs. Humphries turned in the best game of his pro career on his return to the field for the first time since he left the Week 1 defeat to the Lions. Humprhies allowed two hurries and was a force in the run game creating vertical movement on the left side for Peterson to exploit on his explosive debut. In combination with improved displays from A.Q. Shipley (74.9 overall grade) and Jared Veldheer (75.6 overall grade) this was a performance to give hope that this Cardinals’ offensive line could start to come together in the coming weeks. Peterson was stingy in coverage, being targeted four times and not allowing a reception while notching a pass break up. Peterson shut out opposing WR Mike Evans when matched up against him on four targets. Teams will continue to shy away from Peterson’s side as he’s only surrendered seven catches on 20 targets thus far. Peterson left the game late with a leg injury so it remains to be seen how that will effect him going forward. Chandler Jones was a tough task for Tampa Bay’s offensive line, he accounted for 10 total pressures and recorded two sacks. Jones finished the game with a pass-rush productivity (PRP) of 17.8, which is currently tops for Week 6 among edge defenders. Jones did most of his damage rushing from the right side, recording seven pressures on 34 pass-rush snaps. Jones seven sacks thus far put him on pace for his career-high of 14 in 2015. Fitzpatrick came in midway through the second quarter after starter Jameis Winston left the game with a shoulder injury, he was presented with a tall task entering with a 24-point deficit. He played admirably on his way to 290 yards and three touchdowns. Facing that deficit, Fitzpatrick had to push the envelope as he complete 8-of-13 passes that traveled 10 or more yards through the air. His only real blemish came on the interception when Cardinals corner Tramon Williams jumped a hitch route intended for WR Mike Evans when the Bucs on their own 1-yard line, leading to an Adrian Peterson one-yard plunge for a score. Brate tied for the team lead in recpetions with six on seven targets, he reaped the benefits of an aggressive offense that was in a hole throughout much of the game. His 151.5 passer rating when targeted was tops on his team as he worked against Karlos Dansby and Tyvon Branch on the majority of his targets. Brate has been riding a hot streak the past three weeks, catching 15 passes for 224 yards and three scores in that span. 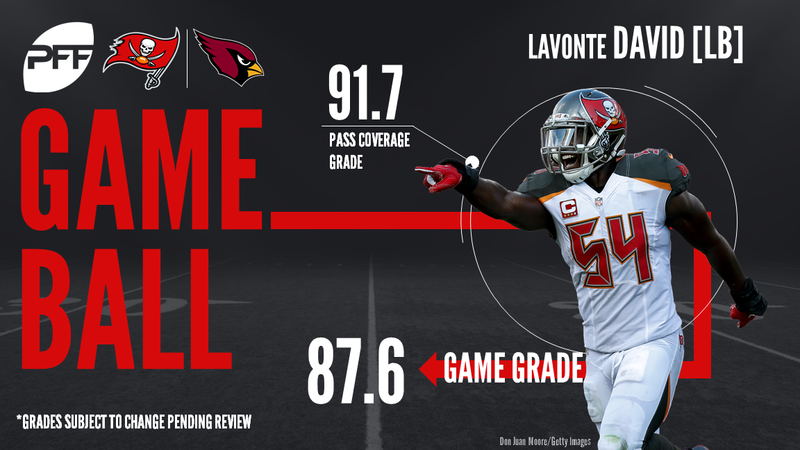 David may only have racked up one stop compared to five apiece in his first two games this year but he had a huge impact in swinging this game back in the Bucs’ favour to spark their comeback. His playmaking ability shone through with a pair of forced fumbles, stripping the ball away from Larry Fitzgerald and recovering for a score which he added to by punching the ball out of Adrian Peterson’s grasp in the heart of a four down stand as the Bucs turned the tide. The Bucs ultimately came up a drive short but it wasn’t for want of impact from their star linebacker. Another rough outing in a rough season thus far for Hargreaves. 50 yards allowed was his second-lowest yardage allowed of the season so far but he surrendered a catch on every target and his performance against the run played a pivotal role in Adrian Peterson’s 100-plus yard day. Hargreaves missed three tackles against the run and was slow to close on Peterson on other carries as well as he all too often presented a soft target for Peterson when the run was turned to the edge. 86 yards on 15 carries off left and right end is the mark of the success the Cards were able to find isolating both Hargreaves and Brent Grimes against the run.